Products and Shop related pages did not get imported. Error messages saying the Portfolio items did not get imported. The easiest way to import our demo content is to use Unyson plugin Demo Content Importer. Our importer will give you all pages and posts,several sample sliders, widgets, Theme Options, assigned pages, and more. This is recommended to do on fresh installs. It will replace the content like posts, pages, portfolio, etc., . It will, replace Theme Options, Reading settings and Widget settings.To import our demo content, please see the steps below. Install and activate these plugins before you proceed: Revolution Slider, Layer Slider, Designtheme Core Plugin , Unyson plugin and WooCommerce. Woocommerce is only needed for an online shop. 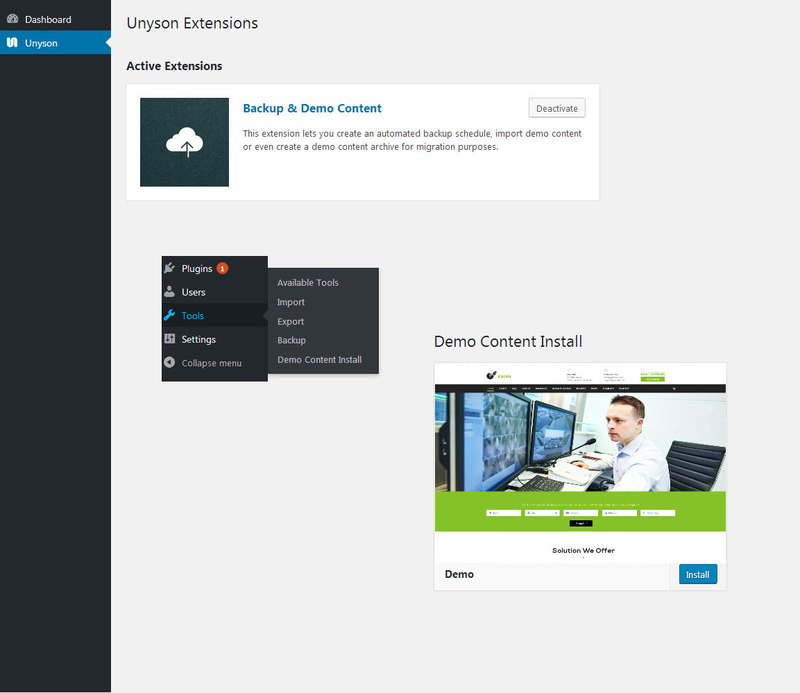 Navigate to the Unyson > Active Extensions > Backup & Demo Content (Install). Navigate to the Tools > Demo Content Install > Select the demo Content > install. Please be patient, as it may take few minutes to import everything. Once it is completed, you will receive a success message finally.